As a historian, I focus most of my research and writing on significant events and movements. Still, I have a fascination for quirky, odd, out-of-the-way, almost ignored historical sites. That inscribed rock by the side of the road, covered in vines that few people notice…I will happily spend too much time searching it out. So, when I practically stumbled into Sargent’s Folly in the Franklin Park Zoo a few weeks ago, it made my day. Franklin Park was designed by Frederick Law Olmsted (famed designer of New York’s Central Park) as part of his ambitious plan known as Boston’s Emerald Necklace. The Necklace, a chain of parks, walkways and green spaces, is anchored on its southern end by Franklin Park and on its northern end by Boston Common. The Common, of course, already existed. The new Franklin Park (named after Boston native Benjamin Franklin) would be, by far, the largest single park space in the Emerald Necklace, an area of more than 500 acres. Laid out in the 1890s, it has come to be regarded as one of Olmsted’s greatest works…in the opinion of his step-son and successor, it was his best. The majority of the park still serves the purpose Olmsted envisioned, although more active recreation has been added over the years including a golf course, tennis courts, athletic fields, etc. Olmsted also envisioned a section of the park set off as an animal preserve for native species…again, the idea being that Bostonians should have a close-by opportunity to experience the natural Massachusetts landscape and wildlife. This was implemented, but it very soon turned into a traditional zoo featuring exotic animals from around the world. The Franklin Park Zoo has had a checkered history—phases of success and neglect. Boston, with its remarkable historic sites and famed museums, has never really placed an emphasis on developing a world-class zoo. And the zoo is still struggling. I had read the poor reviews, but finding recently that my daughters and I had a free Saturday with no other particular plans, I decided to give it a shot. It was sort of sad, really. And it pains me to say that because I know all too well how challenging it is in this day and age to keep a non-profit organization healthy and above water. Disappointing as it may have been, my girls were good sports and we made a pleasant afternoon of it. We came upon Sargent’s Folly along a curving pathway in the lion and tiger area. It was rather obscured by brush. If I recall, the only interpretive signage was a laminated piece of paper. My girls were not at all surprised by my instant infatuation with this great heap of rocks. It clearly did not fit in. And I got the sense that it is almost purposefully hidden by the zoo, as though they don’t really know what to do with it. Postcard of Sargent’s Folly before the zoo was built. 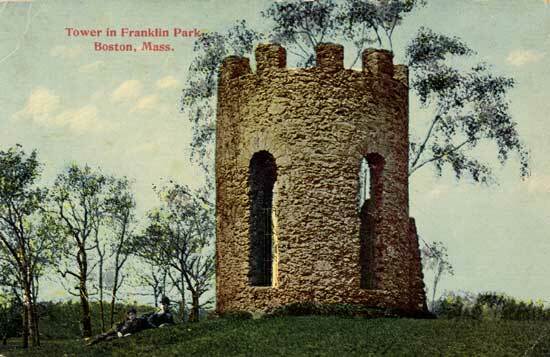 Sargent’s Folly predates Franklin Park. It was built in 1840 when much of that land was the estate of Lucius Manlius Sargent. He was the youngest son of one of Boston’s most prominent Revolutionary War era merchants, Daniel Sargent. Lucius was an odd bird and ornery, referred to by a contemporary as “preeminently a good hater.” He was kicked out of Harvard College for writing a paper scathingly critical of a professor he did not like. He became a vocal advocate for the temperance movement…and did not mince words in censuring those whom he deemed to be enemies of abstinence. Curiously, he was equally critical of abolitionists. A peculiar thing because the temperance and abolitionist movements usually dovetailed nicely. But Lucius Sargent loathed those pushing for emancipation and often locked horns with William Lloyd Garrison through dueling editorials and blasted Ralph Waldo Emerson in his writings. Lucius Sargent was also an antiquarian. He admired the crumbling Medieval towers that dotted Europe’s landscape and wanted something similar to grace his estate. He actually built two stone structures resembling old ruins. One served as an astronomical observatory. The other, taller tower served no purpose whatsoever. And that is the definition of a “folly”…at least in architectural terms. A structure, often out of context, that serves no purpose. Sargent’s Folly was a popular subject, in the late 19th century, before the zoo was built, for photographs and postcards. 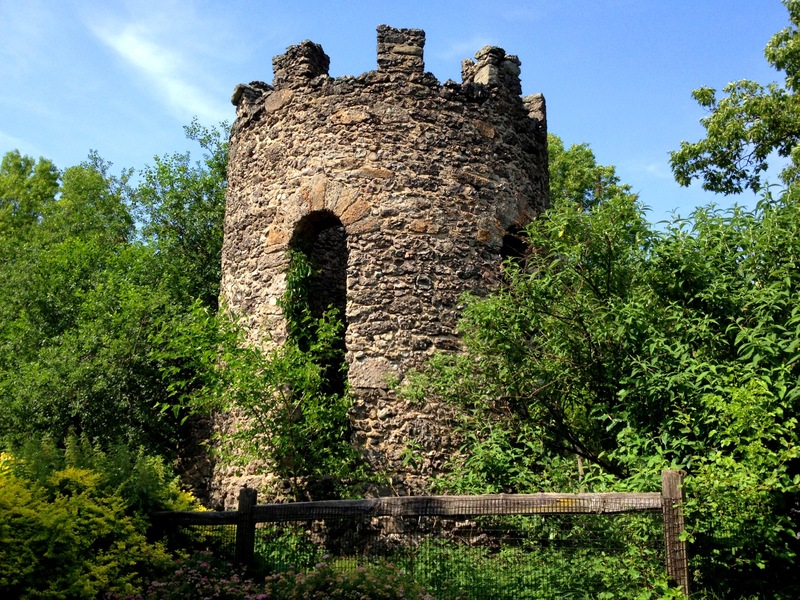 Olmsted wanted to preserve the Folly, maintaining its striking presence in the landscape. After his death, when the zoo was built, it was left standing, but gradually obscured. Now it is lost amidst lion paddocks. Seems a pity. As I was sharing these thoughts with my daughters, they listened patiently for about a minute. Then began physically dragging me towards the tiger paddock with words to the effect of, “Dad, step away from the historical thing.” Despite the eye-rolling, they got it. And they’ll remember it. The tigers were not nearly so interesting. At least not to me. Richard J Berenson; Jon Marcus; Susan Cole Kelly, The Complete Illustrated Guidebook to Boston’s Public Parks and Gardens, (2002), p. 74-75. Frederick Law Olmsted, Notes on the Plan of Franklin Park and Related Matters, (1886), p. 42. Julie Arrison, Franklin Park, (2009), p. 59.